I wanted to protect my SteppIR BigIR antenna from accidental Tx while the antenna is tuning. SteppIR antennas can be damaged by high-power TX (>100W) while the antenna element is moving - arcing between the moving antenna tape and the static brush will cause damage to both. The 80m coil for the BigIR Vertical (which I have) is even more vulnerable to damage from high power Tx during tuning. The coil taps are switched by a special Roto-Switch, utilizing copper PCB pads as contact points for the switch(see my BigIR article at http://www.kotarak.net/). Arcing during high-power transmit can damage the copper foil of these contact points! The easiest way to protect the antenna is to inhibit the Tx Key signal going from the transceiver to the amplifier, while the antenna is tuning. It can be done simply by interrupting the Key line signal with a simple switch. Larry, N8LP is selling kit which does exactly that, but it is automatic. It is a very simple device actually, using an Op Amp as basic comparator. The comparator measures the voltage across a shunt resistor (so it measures the current draw by the antenna motor) and compares it to a pre-set value (adjustable via potentiometer). The Antenna controller is powered through the shunt resistor. Normally the stepper motors are always powered with the so called "holding" (idle) voltage, intended to prevent the antenna element from unintentional movement. When the antenna element is tuned by the controller, the current drawn by the stepper motors increases . SteppIR Tuning Relay detects the difference (increase) in the current draw and triggers relay which on the other hand interrupts the KEY signal to the amp. Very simple and easy to do project. The box is just connected in-line with the antenna's power supply and it doesn't need a separate power source. This is the kit version. It took me about one hour to assemble, test and install it. 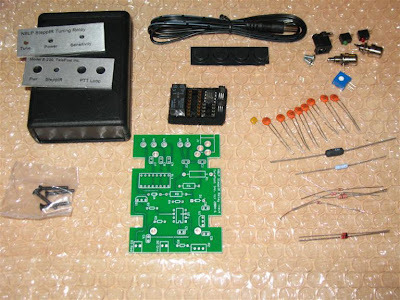 This project can be done on a universal PCB as well and parts can be substituted. Lately, I just don't have the time to order and collect components and play with universal boards and wires so I went with the kit. 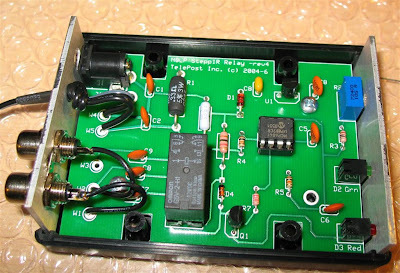 This is the completed SteppIR Tuning Relay. The manual (including schematics) is available at - http://www.telepostinc.com/. On the front panel there are two LEDs - green, indicating Power to the Tuning Relay (and antenna controller) and red LED indicating that the antenna element is moving. It is a much more visible indication than the blinking asterisk on controller's LCD screen. The blue potentiometer is used to set Sensitivity or in other words the current draw threshold. On the back panel there are two RCA jacks for the PTT line. The pigtail with the power connector goes to the antenna controller's power jack and the power supply for the antenna controller is plugged straight in the Tuning Relay box. The integration in the shack was very quick and easy process and the Tuning Relay works perfectly! Another level of protection (again with the Key signal but this time for the amplifier) is provided by "High-SWR Alarm relay" in LP-100A Vector wattmeter.